Is it just me, or does the warm weather make you want to GRILL EVERYTHING?! Burgers, pizza, vegetables. You name it, I want to throw it on the grill. I’m a total wimp in the winter time and probably use my grill 1.5 times total for that long stretch of the year (if that). I wish I felt more compelled to go out in the bitter cold and grill up a steak…but I just don’t. Call me crazy. At least it makes grilling time in the spring/summer all that much sweeter! 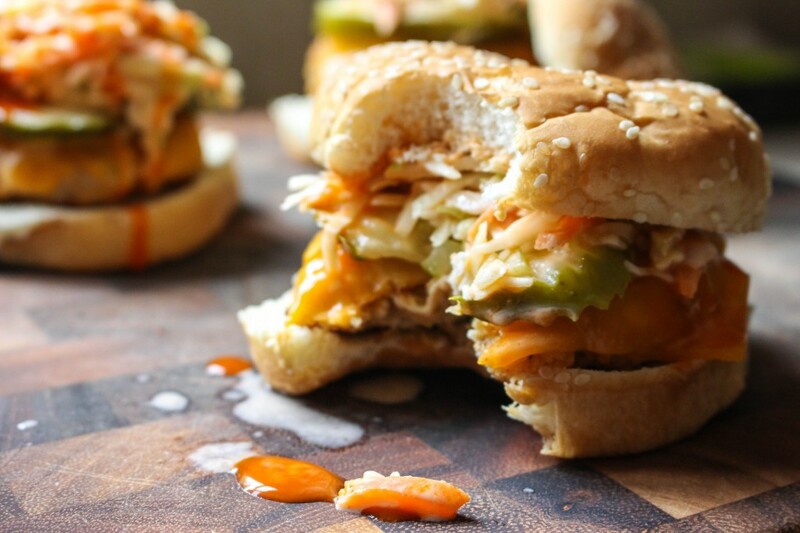 Especially when you’re throwing something like these burgers on the grill. It’s no secret that I love the flavor of buffalo chicken. 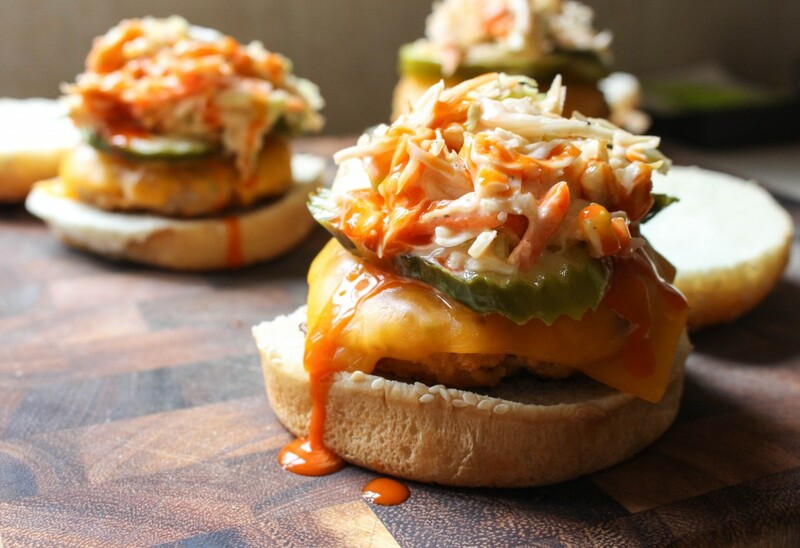 In my short blogging career, I’ve already shared four buffalo chicken recipes with you. And I have several more up my sleeve! I guess my only defense is this: don’t mess with a good thing. If it ain’t broke, don’t fix it. Buffalo chicken is not broke, my friends. Not in my house. These burgers are incredible. If you’re a fan of the buffalo flavors, then these are for you. 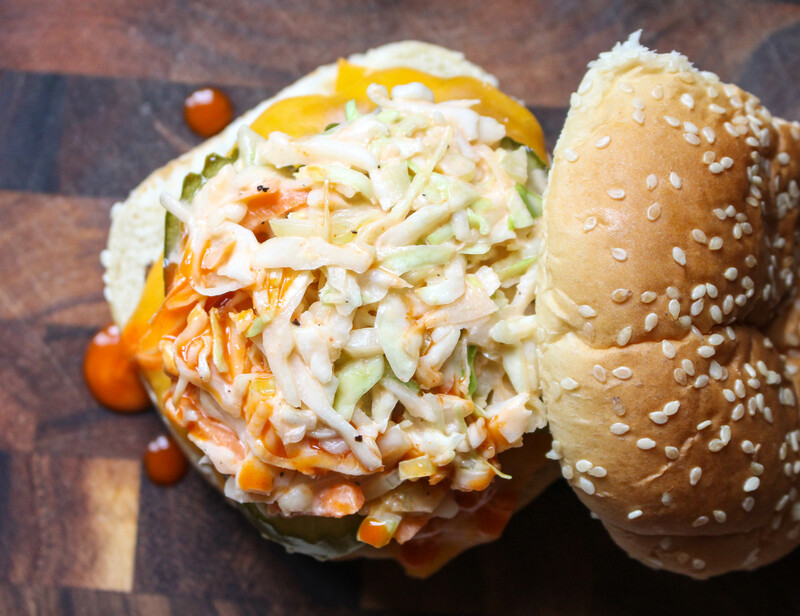 Not only are the burger patties themselves packed with classic buffalo flavors, but the slaw I throw on top ALSO has the buffalo thang goin’ on. Tangy and spicy goodness. Throw on some cheese and snappy dill pickle slices and I’m done. Just done. I could eat a whole platter of these if my body would allow it. Or my conscience. I love the slaw so much that I ate an additional pile of it on the side of my burger. 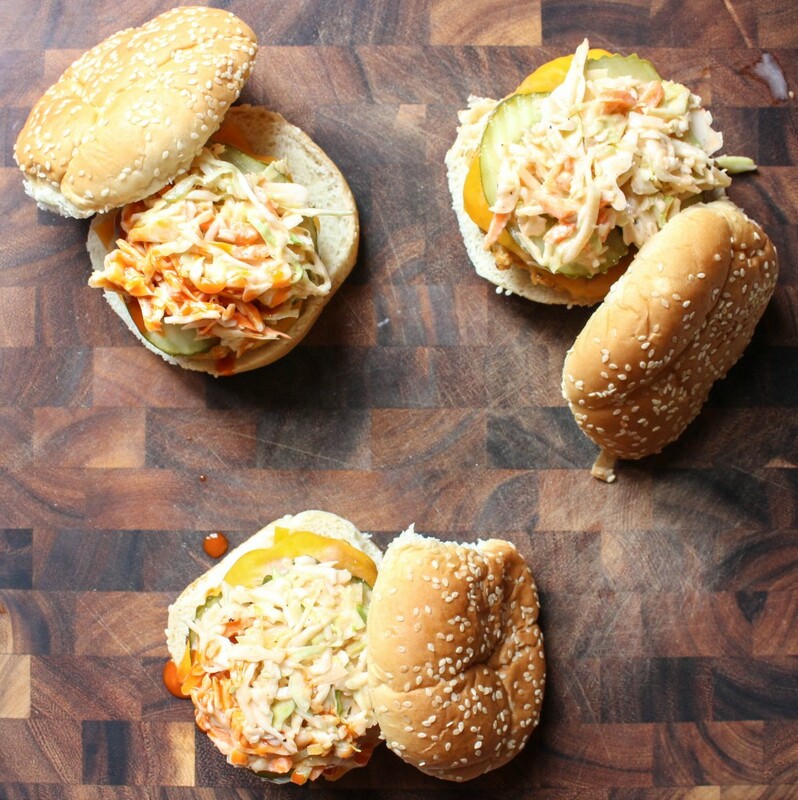 It’s creamy and tangy like regular coleslaw, but with the added crunch of celery and spice of buffalo sauce. I don’t add any mayo to this version (in an effort to lighten things up), but if you can’t have coleslaw without the creamy stuff, go for it. Please don’t skip the slaw! My husband isn’t the biggest fan of slaw in general, and he loved this version. His burger was piled high with it! 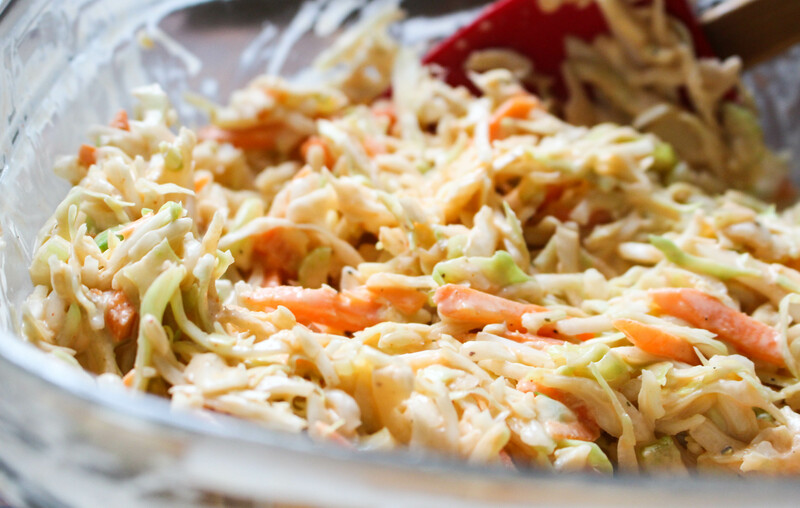 I used a store-prepped bag of slaw mix, but you could definitely shred your own cabbage and carrots for this recipe. I’m just lazy. Definitely add these to your grilling list! They are so.friggin.good. Mix the dressing, vinegar, buffalo sauce, sugar, and herbs together and check for seasoning. Add salt and pepper, if needed. Add in the celery and slaw mix and toss to combine. Cover and refrigerate for at least 2 hours before serving. 1. Combine the buffalo sauce, bleu cheese, dressing, garlic and onion powders, scallions, and breadcrumbs in a large bowl. Add salt and pepper, to taste, and check the mixture for seasoning before adding the egg or chicken. Whisk in the eggs and then gently fold in the chicken, being careful not to overmix. Form the mixture into six patties. 2. Preheat a grill or skillet. 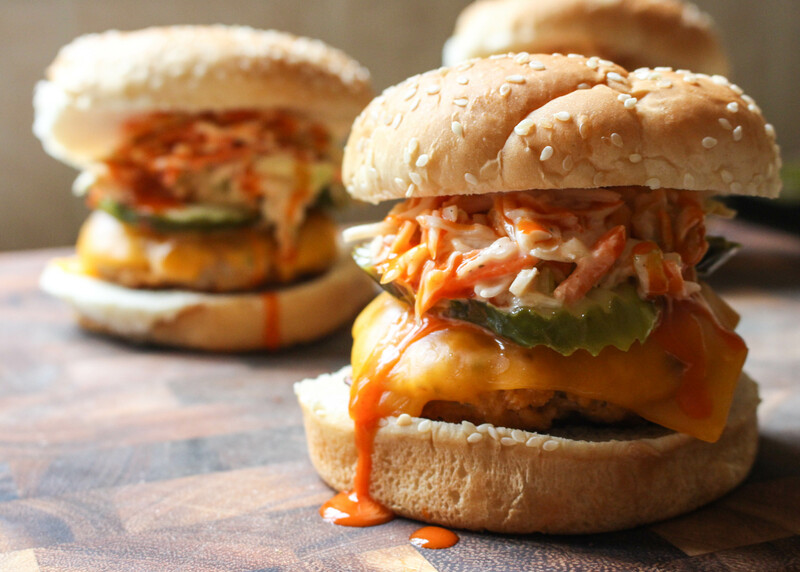 Drizzle the burgers lightly with oil and then place on the hot grill/skillet. Cook for 4-5 minutes per side. During the last minute of cooking on the second side, top with the cheddar cheese. Cover the pan so the cheese melts. 4. 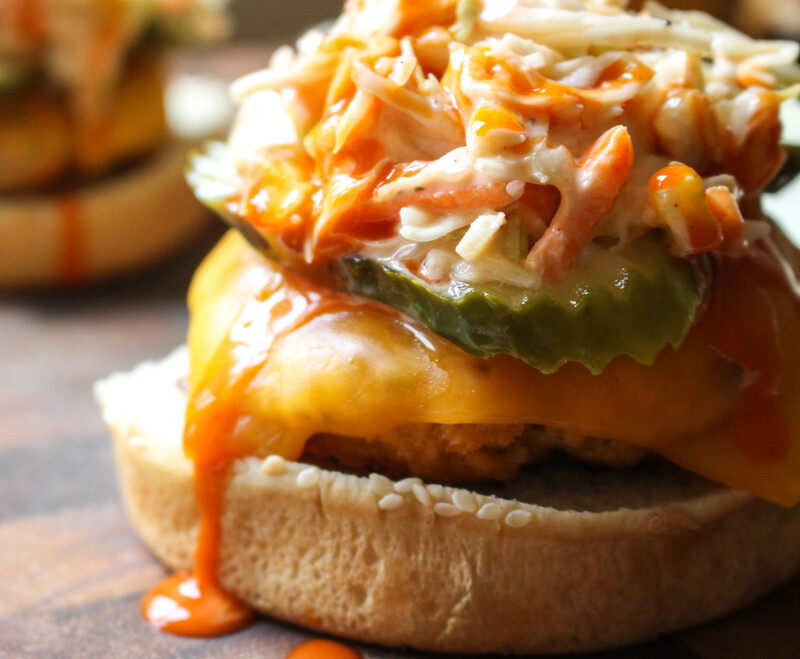 Serve the burgers on toasted buns and topped with additional ranch dressing, buffalo sauce, pickle slices, and the slaw. This burger looks freaking delicious!!!!!!! Thank you! They were really quite fantastic!